A befuddled mind can still grow a beautiful plant! 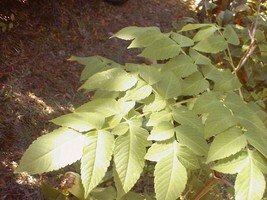 My stumbling journey toward successfully growing a Tree Dahlia (Dahlia imperialis), which was received as a free gift in a Dave's Garden plant trade by mail, and what I learned along the way. It arrived as a tuber tossed in as a “freebie” in a box of plant swaps from my DG friend, KayJones. As was my habit at that time, I potted up the tuber and set it aside without putting a label on it. I thought, because it was so unusual, I would surely remember its name. I have since recognized that my memory is not always as acute as I would like it to be. I have a few dozen UFOs (Unidentified Flowering Objects) sitting around in pots in my yard from roundups and propagations from friends. I’ve come to appreciate the value of providing a common name, or more preferably the botanical name, on a permanent label for a plant upon receiving it. I otherwise spend hours in frustrated befuddlement trying to ascertain what plant I have. If my angst finally grows great enough, I post a photo of the plant in the DG Identification Forum. I usually have an answer within a short time. The freebie tuber soon sprouted leaves. I decided to set it out in my garden when it reached about a foot in height. By this time, I had not only totally forgotten what the plant’s name might be, I had also forgotten whom the generous donor was. I had to guess what conditions the plant might prefer. Assuming that most plants need ample sun, I chose a spot with mostly full sun and a hint of afternoon shade. I watched the plant for a few weeks and was disappointed that its initial growth spurt now seemed stunted. In my attempts to recall some known plant that it might match, it began to look a lot like a large Bidens alba var. radiata--my garden’s most prolific wildflower (which some might call a “weed,” but I value the Bidens for its benefit in providing year-round nectar for butterflies). After about a month with no new growth, I decided the plant might benefit by being transplanted to a new location. Fortunately, I made the choice to provide more shade rather than more sun. Still wondering if it might be an ordinary B. alba ’Radiata,’ I stuck it in a somewhat shady corner of my butterfly and hummingbird garden, with the certainty that I could always pluck it up later. Once it was in a shadier spot, the plant shot heavenward. When it reached about eyeball level with my six foot frame, I was certain that it was not a Bidens, but thought that it could be Jack’s beanstalk. It topped out at about seven feet and began to make flower buds on the topmost branches. The waxy, layered sepals on the buds reminded me of a dahlia, but I couldn’t imagine any dahlia growing this tall. Our northeast Florida subtropical heat and humidity are generally considered not to be conducive to growing most dahlias, so I doubted that my guess at identification was correct. 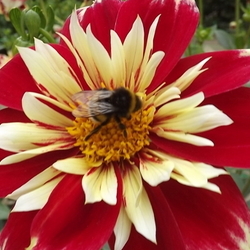 When it flowered, I saw what I was fairly certain was a dahlia blossom! I posted some photos of the plant and blossoms in the Identification Forum. It took ecrane3 only two minutes to provide me with the correct designation for my adoptee. It was a Tree Dahlia (Dahlia imperialis) Dave's Garden Plant Files Page - Tree Dahlia , a splendiferous plant to behold! With a name in hand for the plant, I was able to research its cultivation requirements. 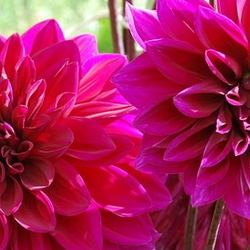 The plant generally prefers part shade and is reported to grow about 8 - 15 feet high, though some observers claim to have seen the plant reaching up to thirty feet in its native habitat of the high Sierra Madre mountains of Mexico (where dahlia is the National Flower). The hardiness is usually listed as being limited to Zones 7 - 8, but it is growing very well in my garden, situated precisely on the borderline of Zones 8b/9a. After getting the plant positively identified, I started a thread in the DG Florida Forum to find out if any of my online “neighbors” were growing this plant, but no one was. I had never seen it in any garden in my region nor for sale in any local nurseries. 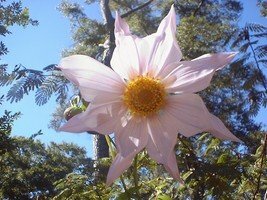 The only comments in the Plants Files were from California, where Tree Dahlias may be fairly common. The lack of widespread use of D. imperialis may be due to its short October - November flowering period just prior to freezing, and its limited tolerances for heat and cold. The plant can take a mild frost, but will die back to the ground with freezing temperatures. It returns from the root crown the following spring. The tall, celery-like weedy stalks may not be attractive to some people, but the flowering phase, with clusters of four to six inch wide blossoms, and the bizarre novelty of having a dahlia plant taller than most humans is worth the space in my garden. The hollow stalks may be easily broken in winds or from the weight of the flowers, but I’ve not experienced this problem. D. imperialis usually bears a pink/mauve flower. It has cultivars that include a white, double-white, and double-pink flower. There may also be red and yellow imperialis, but other than undocumented photos that can be viewed on this link, these remain only an elusive rumor. Another tall-growing dahlia species, D. excelsa, is somewhat smaller than D. imperialis and has an earlier bloom time. It might actually be a better choice for most climates. I intend to slice up my D. imperialis for propagation just prior to our first freeze this upcoming winter. A segment containing at least two nodes can be placed, either vertically or horizontally, in consistently moist potting soil; or divide the tubers. 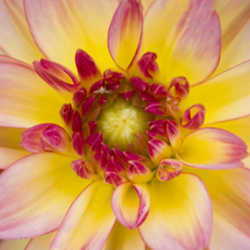 I am now on a quest to obtain all the varieties and species of the Tree Dahlia for my garden collection. This plant’s regal stature brings a crowning touch to the end of the growing season. I will make room for massive arbors of it wherever I can find a suitable space in my garden! Jeremy (JaxFlaGardener) is a frequent contributor to the Florida Forum and other forums on Dave's Garden. In an ideal world, he would spend nearly every waking moment gardening, oil painting, and writing. Lacking such a Utopia, he currently works part-time in the Horticulture Department at the Jacksonville (Florida) Zoo and Gardens. His own half-acre garden is a hodgepodge of just about everything that will grow in Zone 8b/9a, with a homemade greenhouse for his orchids. He is a Master Gardener who esteems digging in the dirt more than book learning, but greatly enjoys research about plants and botanical nomenclature. He is pictured here with one of his large paintings, "The Healer's Leaves," based on a wonderful photo by DGer GardenWife of Ricinus communis (Castor Oil Plant) used by permission.